Seems I just can't quit Philz Coffee! That is what happens when your options are limited. It also looks like I am having a lot of brown food lately--maybe I'm in a mood? 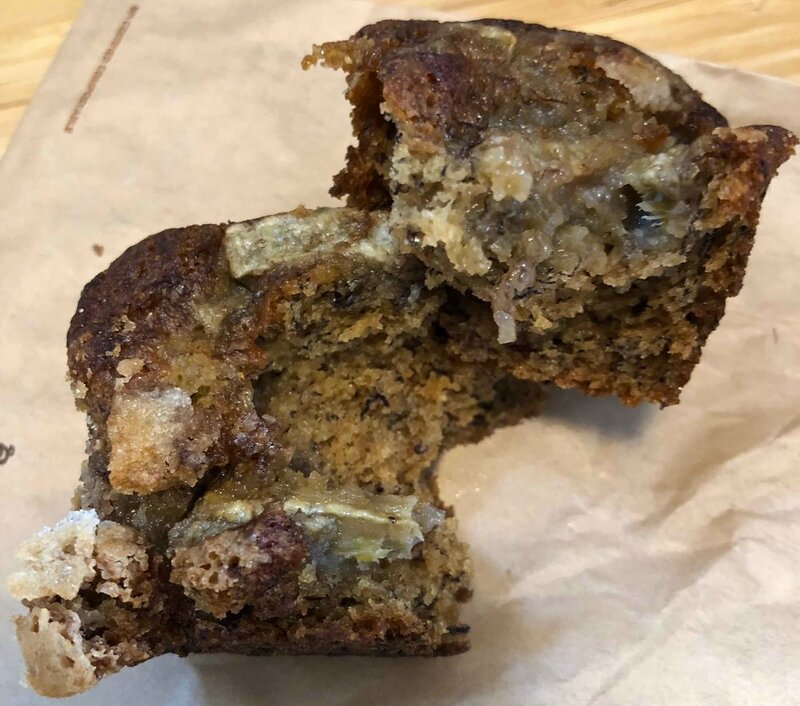 Either way, this will be my last baked good review from Philz as a new coffee shop opened right near my abode and I will have to see what they are offering. Could be less brown, could be even more brown, you will just have to wait and see. As for the banana bread, I didn't hate it. It was one of those mini loaf things for $3 and it was very banana flavorful. This one wasn't quite the dry train as the others though it was much better when I heated it up (and yes of course, slathered a little butter on it). This was of the no nut variety, at least I'm pretty sure it was. There were no overtly crunchy chunks, though could have been some ground ones mixed in, but I'll err on the side of saying there were none. There was, however, a good amount of brown sugar that came through and I even got a small ball of it in the mix. Not a bad thing, unless you don't like a tab of sugar on your tongue. As is, it wasn't too bad and if nothing else, I was getting a bit of potassium in my early morning nosh. A sweet bit, but hey, take it where you can get it, right? Much like this plethora of food news. Presidio Twilight comes back May 17th. It is basically a scaled down version of Off The Grid just colder and closer to the bridge. Woodhouse Fish Co. owners are making the jump to breakfast and lunch with Wooden Spoon in the old Aaxte space at Swedish American Hall. Must say I'm intrigued. Instawork, the new gig economy for restaurant workers. It is hard to find good help. This is a bit surprising since waiting tables and line cooking have sort of been on demand since like forever. Munchery is cutting back their cities and staff to just SF. Seems the instafood delivery isn't working out so well. I did kind of stop ordering from them when they went subscription based. Cathay House, one of the cities most historic restaurants is getting new owners and revitalization--supposedly. Speaking of which, he's some info on "legacy restaurants" in town. Meaning, those that have survived forever. BOUG Creole Deli is making the jump from pop-up to almost semi permanent outdoor type restaurant in Bayview. See, vacant lots can be good for something besides litter. Brown Sugar Kitchen is closing, kinda sort of. They are morphing into a test kitchen because....who knows why. But you will still be able to get their signature chicken waffle when her new Ferry Building outpost opens. Means you won't have to go to Oakland in other words. Mochi waffles and board games? That is what is on offer at the new Game Parlour. I guess you need something to do in the Inner Sunset. Well, looks like at least one of the many Musks is doing something actually charitable and that may work out for many instead of just those who can afford it. Here's your next big food thing and it comes out of South San Francisco? Get ready for indoor farming! Hey, it will be just like what that guy did with the potatoes in the movie "The Martian". Maybe. It's a 12,000! square foot brewing company at Ghirardelli Square. They want to draw locals too, but whether they can overcome the "we're just here for the tourist trade" on their pricing and offerings remains to be seen. May 17 It's crab cake and waffle time! May 10 Who doesn't love.....waffle pizza?